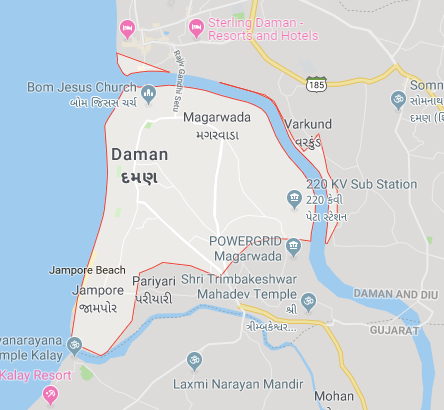 Daman (/dəˈmɑːn/; Portuguese: Damão) is a city and a municipal council in Daman district in the Indian union territory of Daman and Diu. Daman is divided by the Daman Ganga River into two parts — Nani-daman (nani meaning “small”) and Moti-daman (moti meaning “big”). Despite its name, Nani-daman is the larger of the two parts, while the old city is mainly in Moti-Daman. The downtown area holds most of the important entities like the major hospitals, supermarkets and major residential areas.